This week’s best travel deals come from all over the world, so you will surely find something you like, such as a 3 nights Cancun vacation for $505 per person. Book this getaway and get round-trip airfare from Boston to Cancun, 3 nights stay at the Krystal Hotel and Resort Cancun plus taxes and fees. But we have also found other travel deals worldwide, like flight deals to Europe through the Winter with Air France from $746 r/t, the Golden Nugget Hotel and Casino in Las Vegas for $44 per night, 3 nights trips to Oahu at the Sheraton Princess hotel for $645 per person. Hurry, these deals will might sell out in any moment! The Krystal Hotel and Resort Cancun is locate right on the beachfront, very close to the best restaurants and shops as well as lots of leisure and outdoor activities. There is also a golf course and a sports harbor in the area. 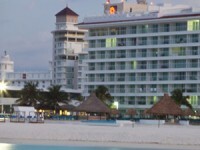 Note that your kids that are 12 or younger stay free at the Cancun resort. If you are smart, you will not book this great Cancun vacation deal until you have searched for similar deals on some of the other provider’s sites. Compare their prices and book the best offer! This entry was posted on Wednesday, October 29th, 2014 at 9:57 am and is filed under Top Deals, Vacation Package Deals. You can follow any responses to this entry through the RSS 2.0 feed. You can leave a response, or trackback from your own site.